"I answered a lot of questions tonight," said Wilder. "I already knew I could go 12 hard rounds and take a punch. I am just excited," he added. Ukraine's Wladimir Klitschko holds the WBA, IBF and WBO titles. 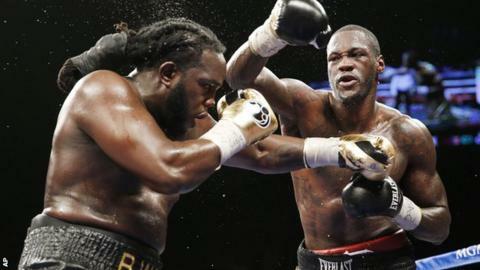 "I want to bring excitement back to the heavyweight division," said the American, who won an Olympic bronze at the Beijing Olympics and knocked out Britain's Audley Harrison in one round in 2013. After Boston's John L Sullivan became the first gloved champion in 1885, the heavyweight division was dominated by American fighters for more than 100 years. "It just feels like I was flat in the ring," he said. "I didn't do what I know I can do. I need to go back and work on the mistakes. "I couldn't cut the ring. I couldn't move my head like normal."